Representatives of nearly 30 enterprises from Chubu region in Central Japan arrived in HCMC on Monday to begin a fact-finding trip in Vietnam, seeking investment opportunities in the fields of industry, commerce, finance and banking and real estate. Speaking at the meeting with HCMC vice chairman Le Manh Ha on Monday, Mita Toshio, chairman of Chubu Economic Federation, or Chukeiren, said this trip is a step forward after a memorandum of understanding on cooperation signed with the Vietnamese Ministry of Planning and Investment last year. Chubu is the venue of many large industrial groups of Japan such as Toyota Motor Corporation, Hitachi and Mitsubishi Heavy Industries. The region reports annual export revenue of US$850 billion, or one-fourth of Japan’s export earnings. Therefore, the trip is expected to open business opportunities for both countries, Toshio said. HCMC vice chairman Ha expected that Japanese enterprises in 2015 would double investment capital in the city compared to the current level of US$2.4 billion. 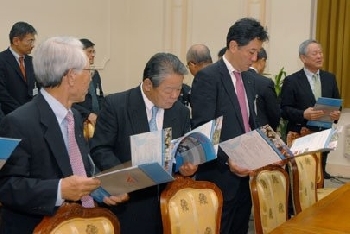 “We also have plans to establish industrial zones for Japanese firms only,” Ha said. Chubu has a strong point in automobile, motorbike and electronics. The Chubu Economic Federation now has 750 member enterprises.